You Can Share the Adventure of our perilous journey reaching this magnificent temple in the Interactive Novel. This is the contents of a leather bound journal which written by the misfortunate and now long dead Caleb Kenneth Turner. 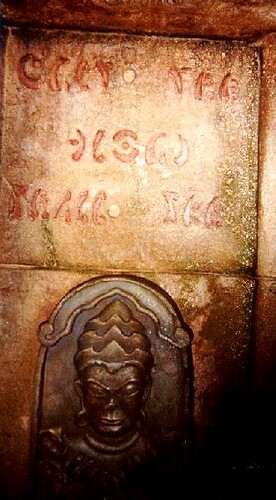 It was discovered near his remains under the skeleton of a horse in the buried colonnade during the 1995 excavation of the temple located within Adventureland of Disneyland. Our journey begins here at the Mercedes Truck . Four perilous nights and four miserable days we occupied this truck with three men and one woman - Indiana Jones™ Salah, Marion and myself, along with the tents, crates, radio, radio-telephone, equipment and, in the caisson, the generator. As rough and rainy as the journey was, it sure beat walking. Our next stop is Indy's tent. 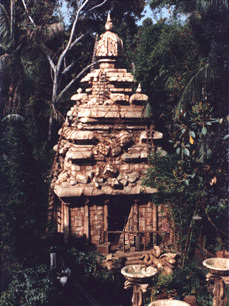 There are tablets and statues strewn around as we walk near the booby trapped staircase leading to the entrance of the Temple of the Forbidden Eye. A stripe of green decoration is on the outside walls of this staircase. The stripe contains a row of Marabic petroglyphs of what appears to be the letter 'I.' They are indeed a series of 'M's on their side. Having had future knowledge, the servants of Mara, knew that the site would be uncovered in the future under what would be Adventureland and decided to match the address number in the count of the Marabic alphabet having been directed to do so by the Omniscient Mara. This was revealed by Prof. Jones. There are two of these tablets. The first tablet behind the hoist block at the beginning of the rope bridge and the tablet in the foliage at the end of the rope bridge just before the entry are identical, but for aging and colouration. They were recently unearthed, restored and erected on May 23, two months after the official discovery, March third, 1935. [The tablets have since been moved near the river loading dock to prepare for shipment. This tablet reveals a double door with a large viper in the form of a cobra, the doors are surrounded by jagged knife points. 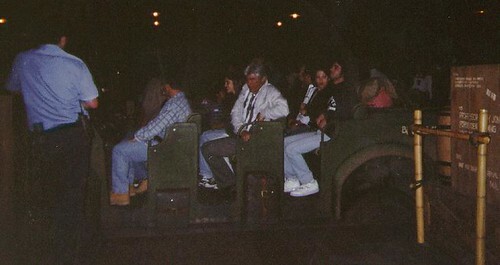 There are two of these tablets one at the center of the rope bridge, and is identical, as above, to the one on the mine car near the "No Stopping, No Looking" river landing. This is painted around the perimeter of the entry dome in red pigment and green dots are used to delimit words. The focus of this room is a large Pictograph or mural described in Indy's notebook on the makeshift bench at the base of the mural. 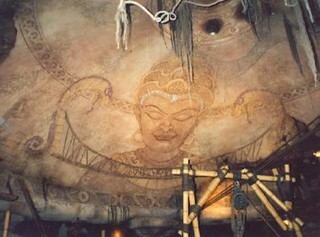 The mural is that of the deity Mara. It is safe to look at any portion of this mural. The eyes are closed. Mara can be seen wearing the Amulet of Future Knowledge, spilling the Bowl of Earthly Riches and pouring the Fountain of Eternal Youth. The sunburst of glory emanating (scholars disagree whether it is behind Mara, and he is shielding it's source thought to be the Jewel of Power, or it radiates from the god himself) has been known to change shape and texture depending on the time of year and weather conditions leading to speculations that the temple was primarily a calendar/observatory meant to mark the growth and harvest seasons, [referenced in the memoirs of Volume 13, Indiana Jones™ subtitled The Temple of the Forbidden Eyes [sic] and published by the Indianensis Universitatis Sigllium Press, 1952 and will not be detailed here.] Notice the circle on the floor with cast remains of the three gifts. It is thought to be enticement to gather, much as a coin nailed to the floor would be. Above is the chamber containing the remains of the Servants of Mara, interred here in the location of high [sic] honor after their faithful and devoted service to the ideas of the temple, thus assisting the local population by organising [sic] ritual by which the society could endure. Following is the largest undisturbed message. There is some speculation about the word 'incurring' as the second 'r' is written with a dot missing. This may have been an oversight by the nearly illiterate Bengaleese, however some would suggest that each mistake would have been directed by Mara himself and thus would have a, yet undiscovered, meaning. Due to the missing piece, the word path has been supplied by the author and is undisputed. The scarab or beetle leads to the crocodile pit, the Servant of Mara or skull leads to the Labyrinth of Chaos, and the cobra or snake leads to the buried colonnade-the safe passage onward. The centerpiece of the room is of a strange, dense mineral and is unique; having been studied by geologists and mineral experts and no example can be found nearby or anywhere else in the world for that matter. The obelisk depicts all the different perils within. Death by: Snakes, Fire, Rats and Spikes. The shape of the base of the obelisk may be a clue to the survival of the temple's guests. As we approach the Obelisk of Doom we are reminded to step only on the stones which are not railed off by bamboo because the poisoned darts there have been exhausted and do not grow back from the bamboo shoots which we have not been able to excavate due to the constant flow of treasure seekers streaming throughout the temple. It seems that during the day they grow tremendously rapidly. But at night when the growth stops and the wind blows, the self sharpening stones slice the new shoots off and the bacterial sludge growing from deep inside the walls above the ground and fed by the constant surge of static electricity and humidity provided by the mammalian traffic. The sludge simultaneously compresses the absorptive darts within their chambers and toxifies them. One hapless Maynard had been excavating the door under the Scarab (beetle) leading to the crocodile pit when an uninterested tourist took a shortcut and cutshort the life of the most wonderful team member we had. While trying to rescue him, the cavern collapsed and several more were buried alive. We have decided not to continue the excavation due to the lack of interest in the destination and voluntears [sic]. Rumor has it that our most imaginative and insightful Maynard has been seen haunting a certain mansion near a river in New Orleans. But that is a volume in itself. The Servant of Mara (skull) petroglyph guards over the impenetrable stone gate leading to the Labyrinth of Chaos. A keyhole has been discovered opening in another part of the temple when the left eye hole is pressed. This fact, and the location are believed to be revealed in the pictographic errors on the Calendar Sarcophagus Stone. However this is, as yet, unproved due to the common error of pressing the viewers left, mirror-wise, as opposed to the left as seen from the servant. Legend has it that a great blue arc vaporizes the person completing this circuit. The doorway under the Cobra (serpent) petroglyph leads to the Buried Colonnade. We have had terrible luck excavating here, the muddy walls continually collapse. We have been able to seal the canal locks at the bottom of the Avenue of Voices, by rebuilding the great hinged doors keeping the river water out, but the walls are dangerously fragile and you should keep your bloody paws to yourself here, at least while accompanied by others. You wouldn't want to be buried alive. And Ernie, the guy behind the broken wall, sees damned well. It is customary to leave coin, fruit or rub the belly of this idol to increase your luck. Unfortunately all my luck has been bad. These amazing fountains have been known to reduce the true believer to fits of giggles. 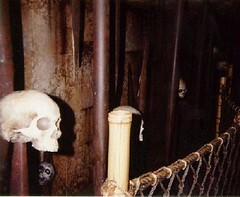 The taller one has been sliding faces from skulls as observed when a certain trader Sam processes his wares here. This is on the stone joist above the small dent that the rolling boulder repeatedly bounced off of at the bend in the avenue of voices. The above two inscriptions are reminders that the deity knows when you are napping, it knows when you're untrue. Much like Christopher Kringle. These four warnings are thought to have been spoken by the Servants of Mara while leading the devout to what was apparently a solid wall before blindfolding or similarly rendering the pilgrims unable to see. This was for their own protection as there is an eye petroglyph on the right above a door where the servants would exit carrying the tribute and fresh servants would emerge from the left door to guide the pilgrim the remainder of the journey. Leather documents have been recovered to indicate that the pilgrim was questioned about seeing the eye so far and those who had were turned away with their tribute in hand. This changed rapidly when Mara became one with the Jewel of Power and the servants sent unfaithful pilgrims away empty handed. This was a vast hall where the stones have been rubbed smooth by knees and other flesh. The documents indicate the name 'the avenue of voices' was not the original name and was replaced when people kept leaning over to those on their way out and asking "How was it?" Responses varied, with samples of youngsters replying "Worth the wait." Heavily laden samples replying "I'm coming back to do it again." and the remainder saying "Awesome, Dude. Knawrly thrash! It was kewel!" which has yet to be deciphered. 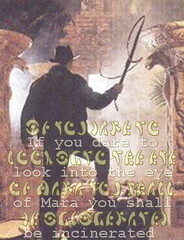 The first warning: "The eye of Mara sees deceit." is on the stone riser just above the depression where the large rolling boulder repeatedly slammed into the wall. The next is on the opposite riser, and further down the last two are near the ceiling just before the pictograph of the three common motifs found throughout the temple of the Amulet of Future Knowledge, the Bowl of Earthly Riches and the Fountain of Eternal Youth. Small wooden signs indicate a word that has remained unchanged in meaning or content in over four millennia. And our last observation of this hall is once again the green 'M's rotated 90 degrees to the north, not 'I's, so it's safe to look at these. Last year, 1935, Abner Ravenwood came through and blasted the top off of this hall so that the large rolling boulder would no longer reset and endanger the tourists. The boulder here had a clever mechanism, ingenious like all of the other self powered devices found within. The boulder is released by the slacking of a vine of unknown family, without visible roots or leaves but definitely alive. This trigger stretches from the Obelisk of Doom where the roots may be to beyond the Gates of Doom where some claim to have seen foliage disappear into (hearsay and unverified as no one has returned from there.) It has been said the vine relaxes and expands its length when touched. When the boulder reaches the end of the hall, pressure from the enormous weight of it forces the locks (large wooden doors which seal the chamber from the seeping river water, like on a dry-dock.) to open, it rolls onto a stone raft tipping valves open and the inrushing water presses the locks (now wooden doors) closed, thus flooding the cistern and when [the rolling boulder] reaching the top tips the raft, the boulder rolls off, and down a channel to its original position resetting the trap. Some vandal has come along and added the missing "who". It still is, however, a clue to the vanishing keyhole. This was the source of the disinformation and subsequent mistranslation by Beloq's crew. It caused years of confusion due to original mistranslation: Little Orphan Annie says: "Be sure to drink your Ovaltine!" Chiseled entrance to rabid bat cavern. There is dispute about the intent of this message and the word spikes or spiked. What worries me is what's missing. This wall was weakened by the large rolling boulder. It had a secret latch which has been destroyed by the grave robbers sent by Beloq. Their remains can be seen in the spike chamber. During the early temple openings to the public the troop transports would frequently stall while Sparky was dispatched to restart them. The ravenous tourists have eaten all of the rabid bats due to a misunderstanding thinking they were Rabbit Bats. 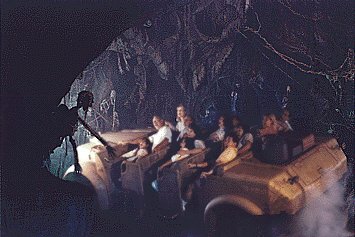 When the queue stalled, guests climbed up into the purple illuminated tunnels and decimated the population. Loud noises would have caused the bats to squeal and beat their wings. 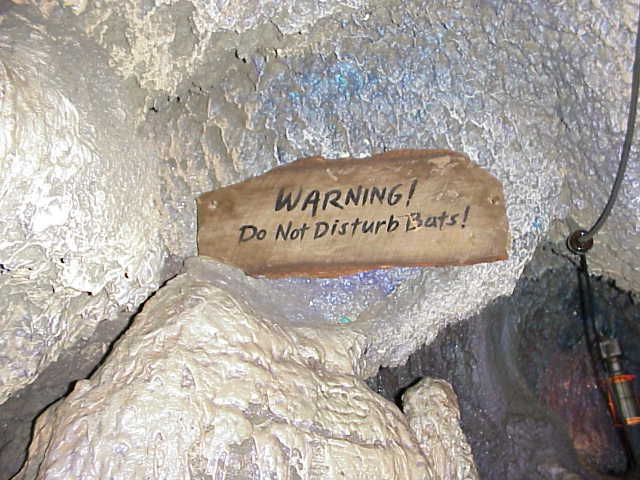 The next cave of bats can be seen by looking up towards the purple light just before the rolling stone gate. Some see a skull. I think the ears are too big. The other side reads beware the coneheads. Be sure to reach into the entemencrusted cubic shaped hole and pull the lever resetting the spike chamber BEFORE entering! Be especially careful here because many of the spikes are poisoned. Especially taking care to pay special attention to the weak and bending bamboo pole [hint, hint] that supports the ceiling. There are no petroglyphs here. It is doubtfull that anyone would have time to scribe them into the stone. 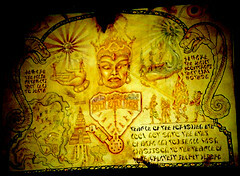 The ceiling of the rotunda calendar will illuminate, at dawn, that which you are to bring as tribute to Mara: Cloth, Jewels, Fruit, Fowl, et cetera by the sun's rays entering the portholes in the ceiling illuminating the pictograph representations of those tributes which circle the wall of the dome's interior. On the winter solstice, December 22 of last year the fruit pictograph was brilliantly lit to show that it has been covered later by what appears to be blankets or cloth. This may indicate a change in climate. If the shaft of light is pointing to the eye, you need only bring yourself. It is my personal belief that the words and the pictures on thecalendar sarcaughphagus stone are reversed for a reason and also that some of the letters are misshapen or inverted. Next year, 1937, I plan to bring a team of cryptologists or code crackers here to meet Indy and resolve this debate once and for all (my wives seem to think that its sole purpose was meant to cause scholars grief and animosity.) As with the stones on the altar, the leather documents (which I have authenticated as having been written by the deity itself,) do not match the tablet inscriptions. Right now Dr. Dunfor Pullit is down below the Calendar Sarcophagus Stone cataloging the immense wealth and rich variety of ancient artifacts. Yesterday, 1936.04.01 we improved his shaky stance in the shaft by supporting him with a rope. 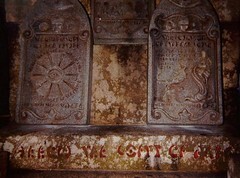 The common script at the bottom of each tablet "But beware the eyes of Mara" seems to have been added at a much later date. Indiana Jones'™ office is a fascinating place with oodles to gawk over, most just fill their stockings with feet and hurry by. The chamber was recently ransacked like a mummy's tomb when our excavation crew found it. Apparently one of Beloq's men snuck in last night and died searching for the jewel of power by opening the latch of the Chest of Calendars without wearing gloves. Indy made us erect a wall and door this morning made of scrap from discarded stenciled crate boards to keep out intruders. We also erected a bulletin board upon which to post the map of the temple that we are working on and the infrequent letters. Mickey Mouse issue of Life magazine, letters and telegrams laying on Indy's desk are rare as it is difficult to get mail through because many of the excursion boat captains jump ship to prospect for the gifts of Mara. 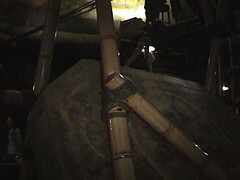 There is a large wooden Propeller standing in the corner which was used in one of the films and has given Indy's office the un-official moniker of "The Prop Room". There is also a scroll on Indy's desk that is unrolled from two staves crested with golden cobras. This is the parchment that, along with the amulet of future knowledge, led us to this temple. This refers to the Handicapped Gate which will be opened by a cast member to allow access to the loading area. We will now climb the stairs to the crossover keeping in mind that the right side of the staircase is safer and to please keep our entire party together at this point. If you study the eye at the top of this capstone you will note that it, indeed, is an open eye which will doom the casual adventurer. These are in the blocks three feet above the ground and also below the text in the capstone. There are curious lifts here, ancient and rusted, yet more advanced than any thing I have ever seen. 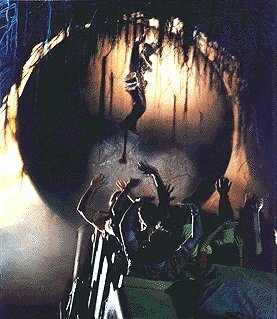 Indy explained that they had future knowledge when the temple was built and incorporated elevators for the [politically correct] hand-de-capitated. We are about to board the troop transport or jeep that will take our party through one of the three doors beyond Salah's mirror contraption. I don't think I'll be able to write much aboard that creaking, squeaking, and bouncing troop transport that Sparky has prepared for us, so I'll put the journal safely away soon. They've motioned us aboard and I'll be riding in the back corner. We're off to make history……! What a cornucopia of abundance is provided by Mara as we pass through the Hall of Promise. In Future Knowledge the ceiling will illuminate your mind. In Earthly riches jewels and coins of gold will rain down from the ceiling. In Eternal Youth your spirit is transmigrated when your old earthly shell withers away, into a fresh , healthy new body. We are surprised at the quick turn ripping the wheel from our driver's hands and plummeting us into the Tunnel of Torment as it crashes and crumbles above and about us. A strange smell, that of fear, accompanies the intense electrical disturbance that accosts our nostrils just as we accept our doomed fate. Then to our surprise there appears the familiar shadow from a strange brilliant red source (perhaps the Jewel of Power.) Indeed, it's Indiana Jones™ withholding the gates of doom and motioning our imperiled carriage off of the collapsing floor toward safety. We turn and twist but tons of debris are strewn into our path from the crumbling ceiling. Fierce winds blow our hats off of our heads as we whip about trying to avoid the false paths, pillars, crypt walls, and crashing, grabbing skeletons and mummies. We almost fall right into the searing hot lava bed but turn left into a dark corridor covered entirely with insects and spiders, some of which are dislodged by the vibration of our truck and land on our bare heads. The gaze from the rotting effigy of Mara is still seismically active with flame in the eye which emits a savagely brutal beam destroying everything in its path. Before we cross the hazardous trembling rope bridge the stare from the likeness of Mara snaps the support beneath our car nearly sending us plunging into the bubbling molten rock below which sears the dropping fragments of rope as they touch the surface before bursting into flame while we are again besieged by the luminous glance pounding dents into our fenders like hammers on tinfoil. of the darkness, it is attractive to Mara's flaming guaze. We clear the rope bridge just in time to avoid plummeting headlong into the fiery chasm only to discover that we are surrounded by what seems to be one hundred thousand snakes. Dinning on all of the available meals is what must be the worlds largest cobra who nearly makes a meal of us! Tires screaming, we descend into the mouth of the huge statue of Mara which is filled with thousands of decomposing human skulls, a hotbed of mud pits that threaten to keep us here forever as we are distracted by the thundering spirit of Mara coursing through our souls. "Watch out for the lava!" we scream as the smoldering wooden bridge ahead nearly splinters and spills us into the steaming vents of flaming rock exploding everything it touches. After we cross, the car breaks down when the engine quits which is just as well because we couldn't see where we were going in this darkness anyway. We get the car started just as rats falling from the wooden bough begin to fill the car. It's just as well, the walls of next room we careen through are covered with the remains of the legions of the soldiers of the servants of Mara. The weight of the tires on the moving blocks release the poison darts that whiz past our faces nearly hitting us, but thankfuly striking the rats instead as they jump from our skidding vehicle. Just ahead Indy has broken through from above and is hanging from a rope. He thinks we are here to rescue him but he ends up… UH OH! LOOK OUT!. Hall of Promise at exit from transport both sides. The scarab, the bony Servant of Mara and the Cobra/Serpent. You have made it this far, you may now look into the symbol at the top of this stone and may gaze into the eye of another without fear. Treasure your gifts and keep them well. Mine were as fleeting as dreams, cash, and childhood. The Jewel of Power is a tiny slice of dark star brought forth from the heavens by the omniscient Mara. Demonstrate your expertise at translating petroglyphs of Marabic - with these sneaky crib sheets! Documents you can download, print and take with you to Disneyland to show your expertise in reading Marabic from the walls of the temple. Download [pc] Marafont.ttf font face into your fonts directory to view the secrets of this site. Download [pc] Marafont.zip compressed font face. Download [pc] Mara.zip compressed UNofficial font face. Download [mac] Mara.sit compressed font face for Macintosh. Get other Indy fonts at IJC.at. You Can Share the Adventure of your perilous journey reaching this magnificent temple! Read the Temple of the Forbidden Eye interactive novel! There just wasn't enough traffic for a 24/7 chat so it has now become a yahoo group which preserves a bit of permanancy. Secrets of the Stone Tiger Revealed! 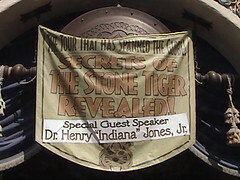 Celebrating Disneyland's promotion of the 2008 theatrical release of the fourth Indiana Jones film Indiana Jones and the Kingdom of the Crystal Skull has Adventureland overlays featuring a violent and exciting children's theatre presentation, a treasure hunt chance to explore a map and translate new codes for a chance to win real prizes, and a knock-down drag-out battle for a small map fragment necessary to locate the Temple of the Forbidden Eye. 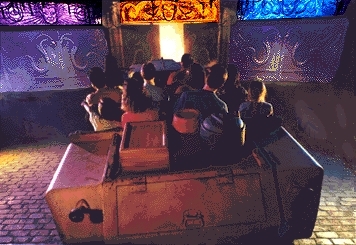 Three exciting pages of Summer of Indiana Jones™ - Adventureland photos and videos. Jungle Cruise journal, a history of the Jungle Cruise by Scott Leonard which was so fascinating that I was inspired to create this Indana Jones Journal. 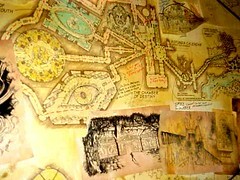 See intriguing Indiana Jones™ attraction news, books, cinema, games and shops research. Take me back to the journal top. Adjust Music: Play Indy MIDI and find more MIDI files heard on this site here. Awards, guestbook, group membership, and webrings. I am not affiliated with any part of The Walt Disney Company, Disneyland®, or Lucasfilm Ltd.
Indiana Jones™ is a trademark of Lucasfilm Ltd. 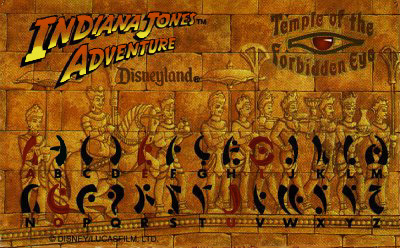 These observations of Disneyland's® Indiana Jones™ Adventure, the Temple of the Forbidden Eye™ are those of Mark Turner alone, also known as the Wizard of Indiana Jones. for doom awaits the unbeliever in the darkness beyond! Click above to see about how to view many of the 3D images throughout this site. Or put your life in my hands and take my TOUR in 3D!.